There is much to see and do at this location. You can take an elevator ride to the top of Aloha Tower and enjoy the great views of downtown Honolulu and the surrounding areas. Or enjoy fine dining at the many local restaurants in the mall. Or how about some shopping for those one-of-a-kind local souvenirs. There are also Marinetime Museum located here and one of the best restaurants in town, Palomino, is located just across the street. 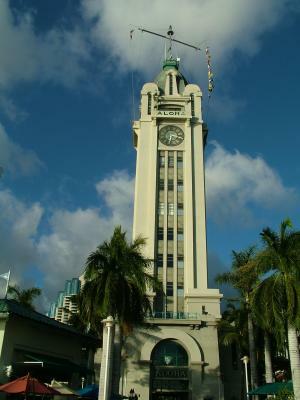 So, take some time doing your busy Hawaii vacation and make time for Aloha Tower. The Drive is about 15 minutes from Waikiki to Aloha Tower. They do charge for parking, but if you make a purchase at any of the mall stores you will receive $5 validation for your parking. Or, you can take bus #20 and #19. Or, take the shuttle that runs to Aloha Tower. Easy to find. From Waikiki go to Ala Moana Blvd until you reach Aloha Tower. Photo 4 - The building in the center of this photo is Harbor Court, home of Palomino Restaurant. Please be tourist smart - do not leave valuables in your car.